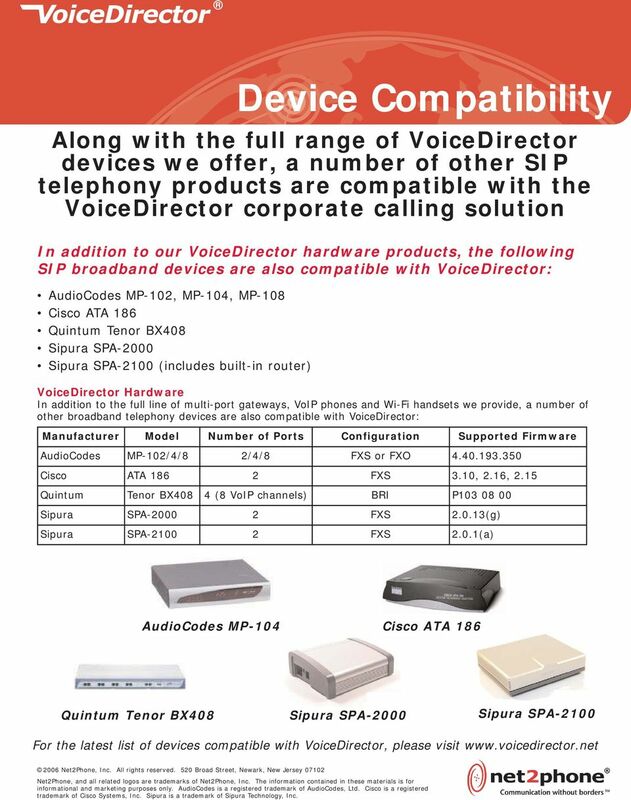 Download "In addition to our VoiceDirector hardware products, the following SIP broadband devices are also compatible with VoiceDirector:"
1 Device Compatibility Along with the full range of VoiceDirector devices we offer, a number of other SIP telephony products are compatible with the VoiceDirector corporate calling solution In addition to our VoiceDirector hardware products, the following SIP broadband devices are also compatible with VoiceDirector: AudioCodes MP-102, MP-104, MP-108 Cisco ATA 186 Quintum Tenor BX408 Sipura SPA-2000 Sipura SPA-2100 (includes built-in router) Corporate IP Network Internet/ Net2Phone Network VoiceDirector Hardware In addition to the full line of multi-port gateways, VoIP phones and Wi-Fi handsets we provide, a number of other broadband telephony devices are also compatible with VoiceDirector: Manufacturer Model Number of Ports Supported Firmware AudioCodes MP-102/4/8 2/4/8 FXS or FXO Cisco ATA FXS 3.10, 2.16, 2.15 Quintum Tenor BX408 4 (8 VoIP channels) BRI P Sipura SPA FXS (g) Sipura SPA FXS 2.0.1(a) AudioCodes MP-104 Cisco ATA 186 Quintum Tenor BX408 Sipura SPA-2000 Sipura SPA-2100 For the latest list of devices compatible with VoiceDirector, please visit informational and marketing purposes only. 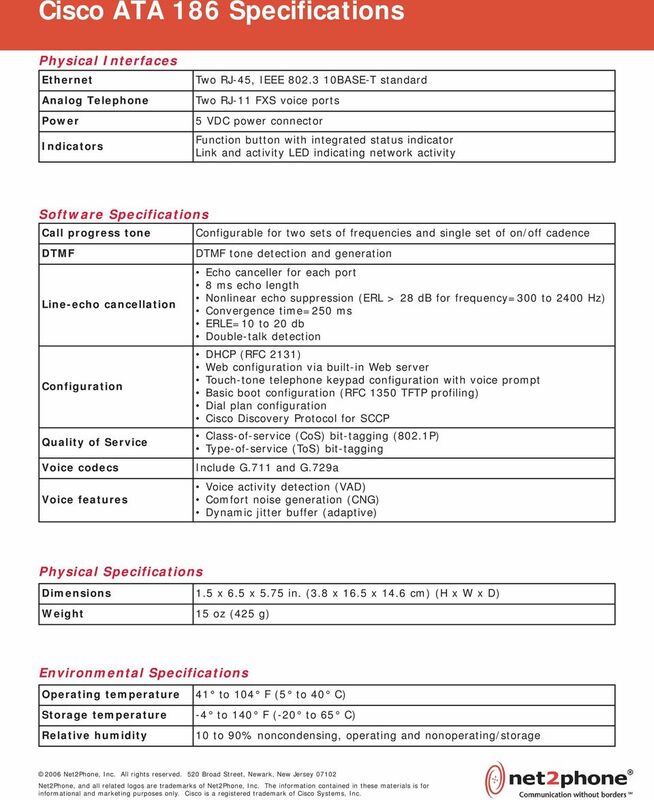 AudioCodes is a registered trademark of AudioCodes, Ltd. Cisco is a registered trademark of Cisco Systems, Inc. Sipura is a trademark of Sipura Technology, Inc.
2 AudioCodes MP-102/4/8 Specifications Interfaces Telephone Interfaces Network Interface FXS or FXO 10/100 Base-T, RJ45 Channel status and activity LEDs Voice and Modem Voice over Packet Capabilities Voice Compression G compliant echo cancellation, VAD, CNG, dynamic programmable jitter buffer, modem detection and auto switch to PCM Includes G.711 and G.729a Signaling Signaling In-band Signaling Provisioning FXS, FXO loop-start DTMF (TIA 464B) User defined and call progress tones BootP, DHCP and TFTP Feature management using Web interface Physical Power Environmental Dimensions (H x W x D) Mounting VAC/47-63 Hz Operational: -5 to 55 C (23 to 131 F) Storage: -40 to 70 C (-40 to 158 F) Humidity: 10 to 90% (non-condensing) 44 x x 240 mm Wall mount, rack mount, table top Additional Features Short and Long Haul Caller ID Polarity Reversal Metering Tones Distinctive Ringing Message Waiting Indication Support Up to 7000 meters at 24 AWG Bellcore Type 1 & 2, ETSI NTT and DTMF based CID (India, Sweden, Denmark) Immediate or smooth to prevent erroneous ringing 12/16 KHX sinusoidal bursts By frequency ( Hz) and cadence patterns DC voltage generation (TIA/EIA-464-B), V23 FSK data, stutter dial tone Syslog support (available in Web interface) informational and marketing purposes only. 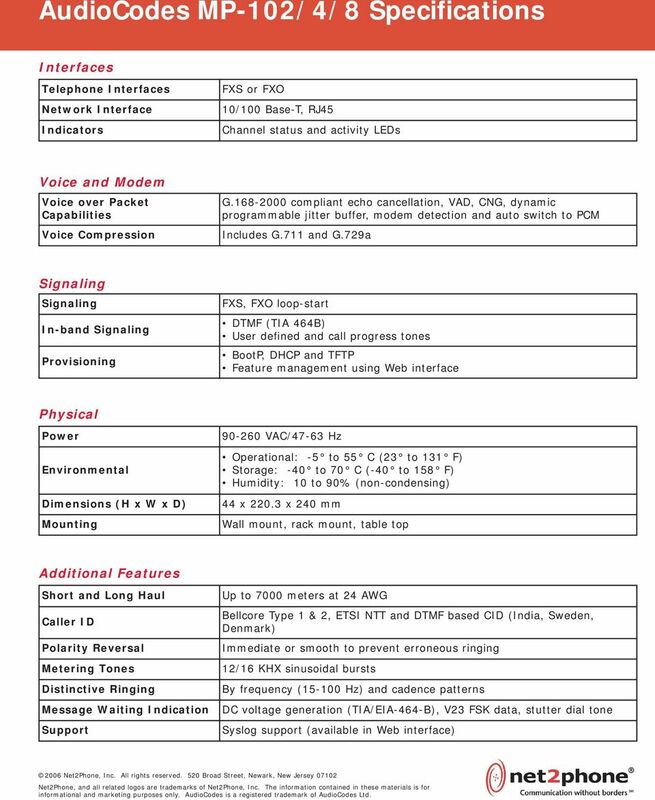 AudioCodes is a registered trademark of AudioCodes Ltd.
3 Cisco ATA 186 Specifications Ethernet Analog Telephone Power Two RJ-45, IEEE BASE-T standard Two RJ-11 FXS voice ports 5 VDC power connector Function button with integrated status indicator Link and activity LED indicating network activity Software Specifications Call progress tone Configurable for two sets of frequencies and single set of on/off cadence DTMF Line-echo cancellation Quality of Service Voice codecs DTMF tone detection and generation Echo canceller for each port 8 ms echo length Nonlinear echo suppression (ERL > 28 db for frequency=300 to 2400 Hz) Convergence time=250 ms ERLE=10 to 20 db Double-talk detection DHCP (RFC 2131) Web configuration via built-in Web server Touch-tone telephone keypad configuration with voice prompt Basic boot configuration (RFC 1350 TFTP profiling) Dial plan configuration Cisco Discovery Protocol for SCCP Class-of-service (CoS) bit-tagging (802.1P) Type-of-service (ToS) bit-tagging Voice activity detection (VAD) Comfort noise generation (CNG) Dynamic jitter buffer (adaptive) Dimensions 1.5 x 6.5 x 5.75 in. (3.8 x 16.5 x 14.6 cm) (H x W x D) Weight 15 oz (425 g) Environmental Specifications Operating temperature 41 to 104 F (5 to 40 C) Storage temperature -4 to 140 F (-20 to 65 C) Relative humidity 10 to 90% noncondensing, operating and nonoperating/storage informational and marketing purposes only. Cisco is a registered trademark of Cisco Systems, Inc.
4 Quintum Tenor BX408 Specifications BRI Ethernet Power 4 S/T ports (8 VoIP channels) 1 Fast Ethernet (10/100 Base-T) Standard RJ-45 (IEEE 802.3) for 10 Base-T or 100 Base-T connections V AC, 50/60 Hz, 35 watts Software Specifications Echo cancellation QoS Support Voice algorithms ITU Rec. G.168, up to 128 msecs tail size Quintum Tenor Manager (GUI) for configuration of remote individual Tenors Quintum Tenor Monitor (GUI) for alarm monitoring, call monitoring and CDR monitoring SNMPv2 Agent Command Line Interface (CLI) IP TOS DiffServ Code Point Voice activity detection (VAD) Comfort noise generation (CNG) Jitter buffer (adaptive) Dimensions 1.75 x x in. (4.5 x 44.5 x 27.6 cm) (H x W x D) Weight 8.25 lbs. (3.75 kg) maximum Environmental Specifications Operating temperature 40 to 104 F (5 to 40 C) Operating humidity 20 to 80% noncondensing informational and marketing purposes only. Cisco is a registered trademark of Cisco Systems, Inc.
5 Sipura SPA-2000 Specifications Ethernet One RJ-45 port, 10baseT interface (IEEE 802.3) Analog Telephone Two RJ-11 FXS ports, for analog circuit telephone device (tip/ring) LAN activity/link LED Status LED (in-use, provisioning, idle, alert) Environmental Dimensions Mounting Operational: 41 to 113 F (5 to 45 C) Storage: -13 to 185 F (-25 to 85 C) Humidity: 10 to 90% non-condensing, operating and non-operating 110mm x 93mm x 35mm (4.33in. x 3.66in. x 1.38in.) Desktop or wall mountable Voice Gateway Specifications Voice algorithms Quality of Service Web browser administration and configuratin via integral Web server Telephone key pad configuration with interactive voice prompts Automated provisioning and upgrade via HTTPS, HTTP, TFTP Asynchronous notification of upgrade availability via NOTIFY Non-intrusive, in-service upgrades Report generation and event logging Per line and purpose configurable syslog and debug options Adjustable audio frames per packet Frame loss concealment Echo cancellation (G.165/G.168) Voice activity detection (VAD) with silence suppression Jitter buffer (adaptive) Electrical Specifications Power consumption 5W DC input voltage Power adaptor +5 VDC at 2.0 A max. Switching type with modular wall plug clip v, 50-60Hz (26-34VA) AC input, 1.8m cord informational and marketing purposes only. 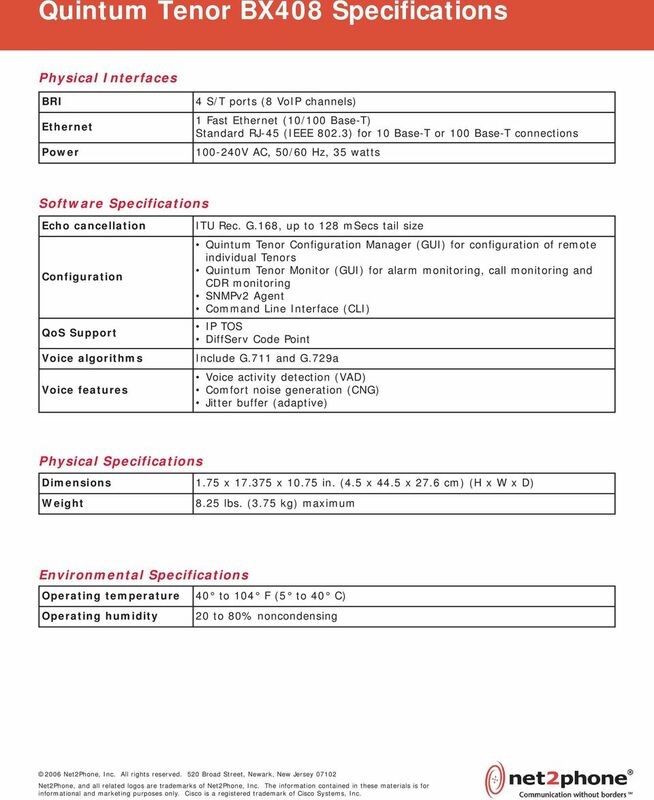 Sipura is a trademark of Sipura Technology, Inc.
6 Sipura SPA-2100 Specifications Ethernet Analog Telephone One RJ-45 port, WAN Ethernet 10baseT interface (IEEE 802.3) One RJ-45 port, LAN Ethernet 10baseT interface (IEEE 802.3) Two RJ-11 FXS ports, for analog circuit telephone device (tip/ring) LAN activity/link LED on each Ethernet port Status LED (provisioning, alert, etc.) 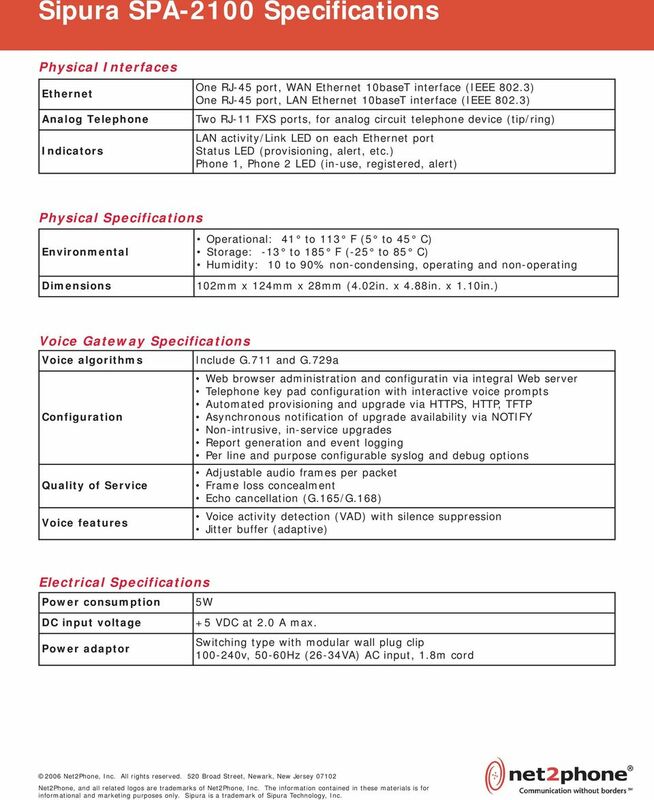 Phone 1, Phone 2 LED (in-use, registered, alert) Environmental Dimensions Operational: 41 to 113 F (5 to 45 C) Storage: -13 to 185 F (-25 to 85 C) Humidity: 10 to 90% non-condensing, operating and non-operating 102mm x 124mm x 28mm (4.02in. x 4.88in. x 1.10in.) Voice Gateway Specifications Voice algorithms Quality of Service Web browser administration and configuratin via integral Web server Telephone key pad configuration with interactive voice prompts Automated provisioning and upgrade via HTTPS, HTTP, TFTP Asynchronous notification of upgrade availability via NOTIFY Non-intrusive, in-service upgrades Report generation and event logging Per line and purpose configurable syslog and debug options Adjustable audio frames per packet Frame loss concealment Echo cancellation (G.165/G.168) Voice activity detection (VAD) with silence suppression Jitter buffer (adaptive) Electrical Specifications Power consumption DC input voltage Power adaptor 5W +5 VDC at 2.0 A max. Switching type with modular wall plug clip v, 50-60Hz (26-34VA) AC input, 1.8m cord informational and marketing purposes only. Sipura is a trademark of Sipura Technology, Inc. Combining Clear Voice with our Business Class connectivity services gives you the first major stepping stone in convergence. Part Number: 203285. HG253s V2 Home Gateway Product Description V100R001_01. 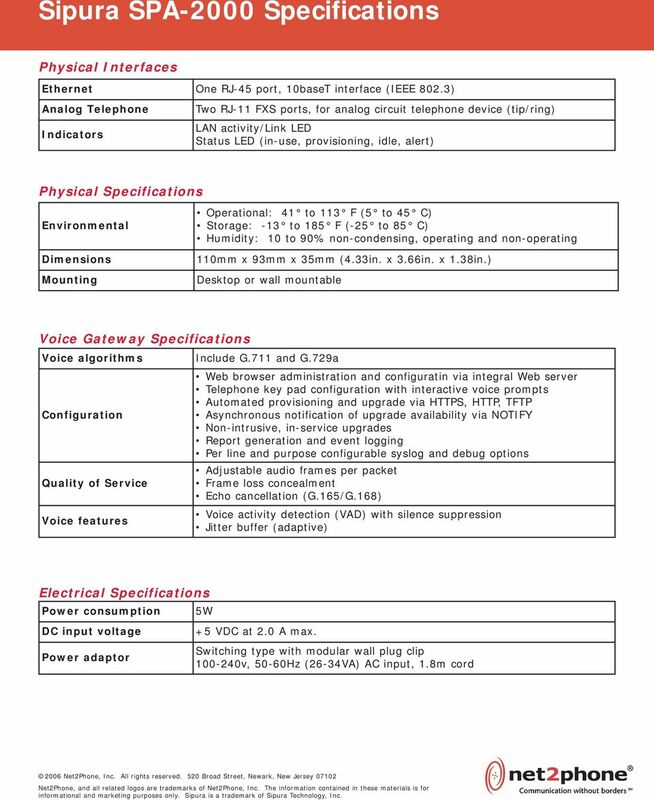 Issue HUAWEI TECHNOLOGIES CO., LTD.
COMPREHENSIVE INTEROPERABILITY WITH SIP-BASED FEATURE SET.